If you want to maintain your beard properly, it is just not enough if you buy costly shavers and trimmers. You have to ensure that you pamper your beard with the due care that it deserves so that your hair grows healthily and doesn’t cause any skin irritation or rashes for you. If you are just starting to grow a beard, you should be extra careful because the new hair growth on your face might be quite uncomfortable for you in the initial stages. So how do you ensure that your beard and skin are cared for properly? The answer to this question lies in Mo Bro’s Grooming Kit. It is not only your beard that you should care about. You should also maintain and pamper your moustache as well so that you can use your shavers/trimmers to get the style that you want from it. 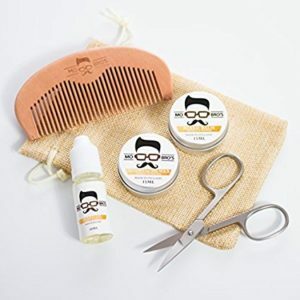 Mo Bro’s Grooming Kit is a collection of relaxing waxes, balms and oils that give your beards and moustaches excellent comfort and flexibility to be subjected to the different settings of the shavers. The Mo Bro’s Grooming Kit is designed exclusively for first-time beard growers to give ultimate protection and comfort for your beard and moustaches. You can also trim your hairs when they grow beyond the desired level, with the help of the comb and scissors in this kit. Here is a look at the features of this kit. The contents of this kit bring about a soothing and relaxing effect on your beard/moustache because they are made from highly effective natural ingredients like Shea Butter, Beeswax, Petroleum Jelly, Sweet Almond Oil, Grape Seed Oil and Peppermint Oil. The kit contains an instruction manual which explains detailed steps as to how to apply the balm, oil and wax so that you don’t have any confusion. Since this grooming kit is just under £12 and comes in various natural scents, it is a good investment. Try it out for keeping your beards and moustaches naturally hydrated at all times and to protect your skin from allergies. This grooming kit comes in as one of the best in the UK and has 4.4 out of 5 stars with over 83% four stars or more, and under 3% with one star.